Hey! Today was the first Burrito Friday at The Grotto of the new year, as far as we know. So hopefully you don’t get extra indigestion, due to the fact that it’s Friday the 13th and whatnot. Anyway, we figured this would be an excellent time to fire up the blog again. In order to do this, we felt it might be a good idea to come up with some kind of actual story or reason to work this afternoon. 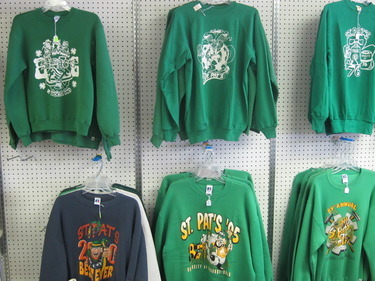 So here it is: We’re on a quest to find the oldest St. Pat’s sweatshirt. Specifically, we want to know what year this particular tradition started. Local businessmen Mike Greenway and Larry Stratman have a collection (housed at University Book and Supply on Pine Street). Their oldest sweatshirt is from 1967. We know they go back a little further. Rumor has it the first year was 1962. Greenway and Stratman are searching for several sweatshirts currently missing from their collection, specifically ones from 1981, 1979, 1978, 1968 and anything before 1967. Let us know if you have any of these and if you want to sell. We’ll pass the info along. Also, Greenway and Stratman have extras of some of the old sweatshirts, if you’re in the market to buy. P.S. Melody Lloyd from S&T’s Archives tells us she appears to have found black-and-white photographic evidence of sweatshirts from 1963 and 1964. She had to use a magnifying glass. Thanks Melody! I am in the market for sweatshirts from the 80s. Can you connect me to Mr. Greenway or Mr. Stratman? Thank you!